Serial Scoop: 'Days of our Lives' Star Eric Martsolf Teams Up With Holly Norman To Record "Days Go By." 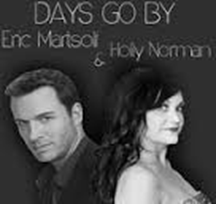 'Days of our Lives' Star Eric Martsolf Teams Up With Holly Norman To Record "Days Go By." In the late 90’s, one of Eric’s musical ventures included being a featured performer in a theater at Dollywood, Dolly Parton’s nationally recognized theme park in Pigeon Forge, TN. It was there Eric first met and worked with Holly Norman, performing together in a 50’s themed show, Let The Good Times Roll. After leaving Dollywood, Eric continued to pursue music, but his acting abilities landed him a major role on the soap opera Passions. Currently, he plays the Brady Black character role on Days of Our Lives, for which he won an Emmy Award in 2012 for best supporting actor. Almost 20 years went by since Holly and Eric had seen each other or spoken. Then by fate they were reunited. Eric was invited back to Dollywood in August 2015 to participate in a charity/fan event. Holly was contacted by the organizers to surprise Eric for the event, as sort of a homecoming celebration. During the event, Holly and Eric ended up reconnecting and reminiscing about the paths their lives had taken, Eric’s to California and Holly’s to Nashville. They talked about their love of music and singing and Holly told Eric about a duet song she’d written that she’d been looking for the perfect male to sing on with her. Eric jumped at the chance to be able to come to Nashville and record. So, in October 2015 while Eric was in Nashville for a DOOL fan event, he carved out some time to record his vocals at Funhouse Studios on legendary Music Row – and there, magic was made! The song, “Days Go By”, is about a couple parting ways; something Eric relates to all to well since his Days character Brady can’t seem to settle down with the right woman. The song really showcases the beautiful, effortless blend of Holly and Eric’s vocals. With Holly’s sweet, angelic tones and Eric’s deep, rich voice, the song is certain to capture audiences and paint a vivid picture of a love gone wrong. Holly and Eric are excited to be working together again and hope to make this the start of something special. The song is now available on iTunes at http://apple.co/1RXzBOX and on Amazon at http://amzn.to/1RHnDtA.